Thwaite’s Original and Thwaite’s Wainwright. This 200-year old Blackburn company is no-one’s idea of a micro-brew: it distributes German lagers and owns pubs as far east as The Barrel, in Walkington, E. Yorks (see a picture of this gorgeous pub – and others in the area) where I sampled a half of each of the above beers while watching the Man United-Chelsea game on Saturday TV. But it does offer tradition: low in alcohol and lightly malty, The Original dates back to the early 19th Century. The Wainwright, on the other hand, named after the Lakeland author, was only introduced for the Brewery’s bi-centennial a couple of years back, since when it has remained on tap. Lightly colored, it offers just a touch of sweetness in the midst of its classically malty taste. 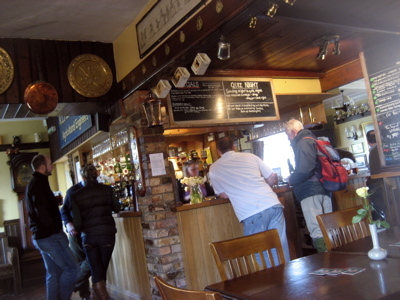 The scene inside the Fleece Inn, Bishop Wilton, East Yorks, Easter Sunday, around 2pm: couple of hikers at the bar, tankards hanging from the ceiling (surely, at this point in the modern age, decorational rather than functional? ), menu on the chalkboard, and an announcement of the regulatory Quiz Night. Consett Ale Works Steel Town Ale, as recommended by the Fleece landlord, whose “taster” filled a good quarter pint. The Consett Ale Works was established in Bishop Auckland, Durham, only in 2006. With all four beers named for the now-defunct Consett Steel Works – a brave and noble choice for a pub that could much more easily play off the romantic name of its actual home town – the Steel Town Ale is the brewery’s “session beer,” with a brown, caramel richness that belies its low alcohol status. Produced out the back of the Grey Horse pub, at the rate of just a few barrels a week, Consett is what my American counterparts would absolutely recognize as a micro-brewery – perhaps even a macro-brewery – and a promising one at that. A pause, perhaps, to note that while I’m writing about beers from “oop north,” and talking of shuttered steel works, and while the old men in Yorkshire still wear cloth caps almost as a religious statement, don’t deceive yourself that the region is any kind of industrial or poverty-stricken wasteland. These are two of the cars that were parked at the Fleece on Easter Day. I have never seen a Vegantune before, and I imagine most vegans, being politically correct as they are, would flee at the very thought of it! The car on the right is, of course, a Ferrari. The one on the left is a Noble Vegantune, a car I’ve never seen before. 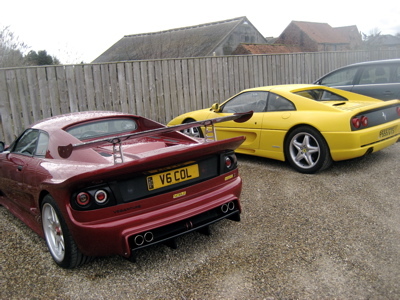 Both were in the Fleece Inn car park in Bishop Wilton Easter Sunday. Saltaire Copper Ale, from a brewery in the West Yorks town of Shipley. Visit the Saltaire web site and you’ll see that they are clearly in love with the whole process of brewing. The site does not, however, list even half the beers in production, some of which I assume must be seasonal. The Copper Ale, fwiw, lived up to name, lightly colored, a touch over 4% alcohol; I see elsewhere that it has been cited as offering aromas of “cereal malts, hedgerow hops and damsons,” and if you can think of a more archetypally rural British description… well, I can’t. A promo pic of the bar at the Green Dragon. Note the Spitfire beer from Kent. A better picture of the bar can be found at the web site, as can the 2010 Spring Ale list. The Green Dragon not only excels in beer and bangers, by the way: it has a fantastic range of wine by the glass, too. Open at weekends from ten in the morning until midnight, it’s a perfect example of the modern English pub expanding its offering to stay in business at a time when some 40 pubs a week are shuttering their doors. That Saturday lunchtime, I was sat close to a couple of women, one of them clearly in her 80s at the very least, happily enjoying lunch with a glass of something non-alcoholic, and a family with young kids, enjoying beers, cokes and food. Over at the bar area, meanwhile, a handful of real ale drinkers were settling in to taste the day’s hand-pumped offerings, while signs up and down the pub emphasized the upcoming music, quiz nights and the like. Typically, I don’t visit pubs often in Beverley, but the Green Dragon will need to now become a regular pit stop. And what of London? 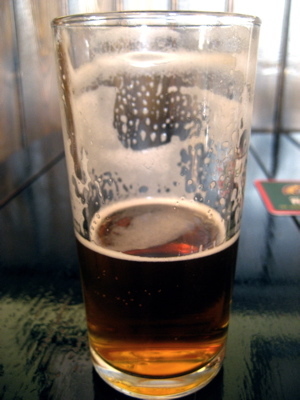 I didn’t drink much beer in many London pubs, to be honest. (And you may have noticed that I generally drank lighter beers on this trip than the heavyweights I could not back in my youth, or that I could have done on this trip too, were it more of a holiday.) I did spend a Friday evening catching up with two different friends at the Spice of Life in Soho, an old haunt that has also coped admirably with the demands of the modern age, serving a wide range of wines, plenty food, with quick efficient friendly service and, equally important, almost obsequiously polite security. Can’t speak so highly of their choice of brewery, however: the McMullen’s ales were generally flat and uninspired in taste, a shame given how much wonderful beer is otherwise on offer in the UK. I fared better, down the road after the Spice of Life closed, with Fuller’s London Pride, as friendly and distinct a pint as you can find in the big smoke. (And one that, unlike almost everything else mentioned here, you can also find in the States.) In the midst of what does, I admit, make my 3-week visit sound like something of a pub crawl, I should note that I had a solitary pint of Foster’s while out on the town of Bexhill on a Saturday night. 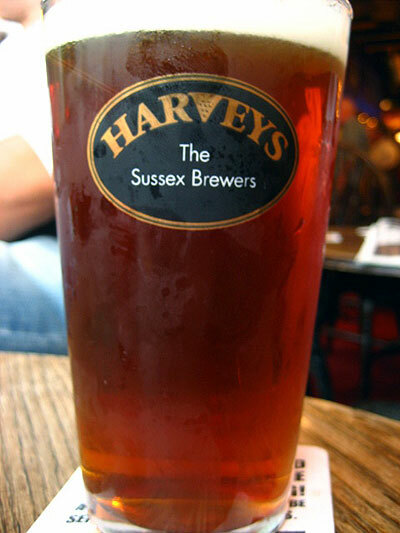 Despite the fact that I must have drunk thousands of pints of Fosters in my teens and twenties, I hated it, could barely get it down me, and gladly went back to the Harvey’s Best. After all, I have a new habit now, and I don’t feel like breaking it. The Consett Ale Works Steel Town Ale: a picture can be worth a thousand words, yes?